De La Salle University Dasmariñas (DLSU-D) surpassed the Guinness World Record for Largest Umbrella Mosaic formed by people currently held by China. 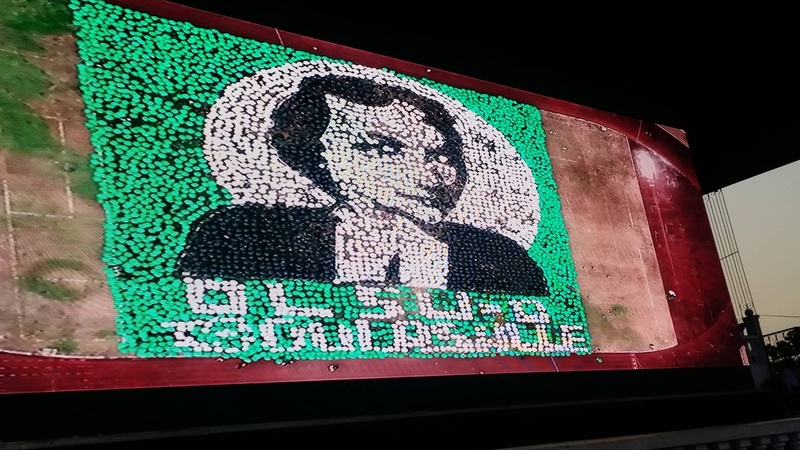 The Lasallian school in Cavite province, dubbing its event as “Animosaic: The Humans of St. La Salle,” made its world record attempt on April 7 at its Track Oval and Football field. La Salle Dasmariñas students, parents, alumni, faculty, and staff participated in the Animosaic with their registration proceeds going to the scholarship fund for students. DLSU-D University Advancement Office (UAO) director Marco Polo talked to Good News Pilipinas about the event’s goals to provide help for scholars while breaking a world record. “We are sure to have beaten it with our 6000 plus participants,” Polo said about La Salle Dasmariñas’ bid to break China’s Guinness Record made in June 2016 with 3,099 people. DLSU-D president Br. Gus Boquer FSC in a DLSUD YouTube video referred to the event as a gathering of friends “who believe in what we do” and as the anniversary project of the celebration of the tercentenary of St. John Baptist De La Salle. “At DLSU-D we create possibilities. Animosaic is our way of honoring our founder St. John Baptist De La Salle on his 300th feast day. Indeed today we are La Salle,” added Polo. DLSU-D’s next step will be to submit to Guinness their proof of breaking the world record with several documents such as video and photo documentation, audit report certification from independent witnesses, among others. WATCH the successful Philippines attempt to break a Guinness World Record held by China and send your congratulations in the comments below to DLSU-D for the Largest Umbrella Mosaic Formed by People. If you are from DLSU-D, tell us your Animosaic experience! WATCH the actual DLSU-D Guinness World Record formation here!